Pour popped popcorn into two very large mixing bowls, set aside. In a large saucepan whisk together sugar, half and half, corn syrup and salt. Cook over medium high heat, stirring constantly until sugar has dissolved. Heat mixture to 232 degrees, stirring occasionally. Immediately remove from heat and pour in vanilla and food coloring. Drizzle mixture over popped popcorn. 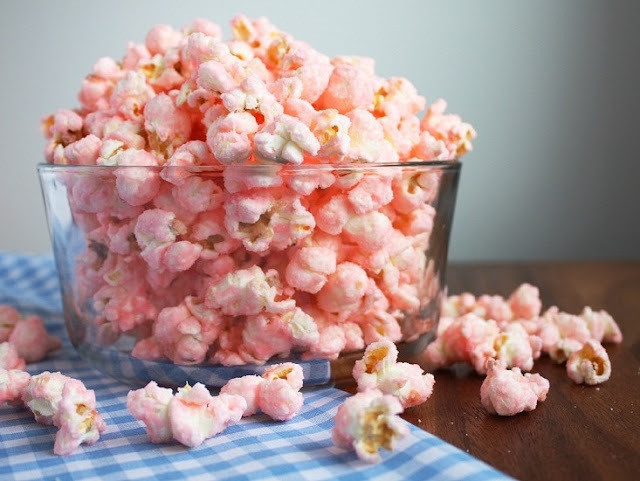 Gently stir popcorn until mixture is evenly coated and coating begins to dry (you'll notice the popcorn kernels separating). Pour mixture onto waxed paper and allow to dry about 20 minutes. Store in an airtight container.